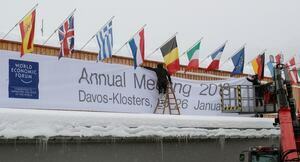 The global elite of governments, corporate CEOs, and financial investors meet for the annual World Economic Forum (WEF) in Davos, Switzerland this week. Their discussion topics include such heart-warming titles as ‘Saving Economic Globalization from Itself’, ‘Global Markets in a Fractured World’ and, interestingly, very aware of the inevitability of another global economic crash, ‘Could 2018 Be the Year of the Next Financial Crisis?’. But at the World Economic Forum it is the global elite talking to themselves about how they can protect and expand the privileges and wealth of the elite, while doing just enough (or even giving the impression that they are doing something that’s just enough) to keep the majority of their populations happy and ticking along without politically challenging the system. 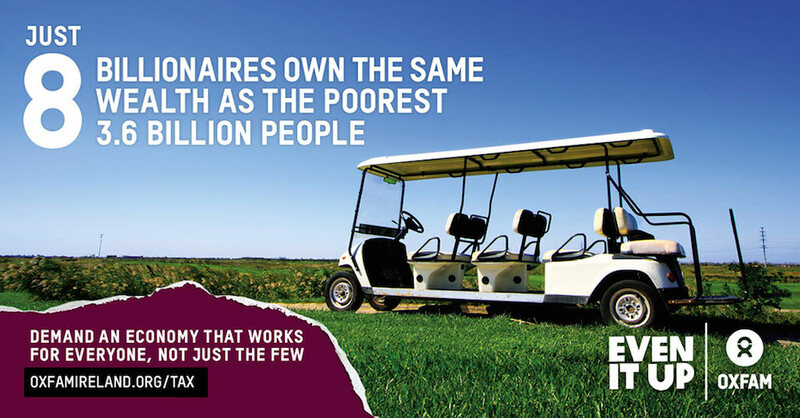 Just look at the world they lead – Oxfam’s Even It Up! campaign )see below) has highlighted that the eight richest people in the world own as much wealth as the poorest half of the world’s population. This is the result of forty years of economic globalisation and hyper-capitalism – the policies promoted by the elite at the World Economic Forum. Inequality, economic instability and environmental destruction have worsened substantially under their leadership and policies. The reasons for the rise inequality are multiple and complex, but strong contributing factors include the fact that wages (which is most people’s income) have not increased relative to the dramatic rise in the wealth of those at the top of society and corporations. The deregulation and globalisation of financial markets and the spread of speculative investment into all aspects of our lives has also unleashed the inherent instability and boom-bust cycles of the market in increasing frequency and ever-greater impact. Inequality has also risen because the state has reduced its role in providing public services like health, social welfare, housing, and education, which in the past played a strong role in reducing inequality and providing more balanced economic development. Now the private sector and the market are much more dominant in these areas. And this was the ultimate purpose of the neoliberal globalisation revolution promoted by global leaders from Margaret Thatcher, George Bush, Bill Clinton, Tony Blair, Angela Merkel and their friends – to facilitate corporations to make as much profit as possible by reducing worker’s conditions and privatising public services, lowering the taxes corporations and the wealthy have to pay, and paying little attention to increasing the risk of financial crises and environmental destruction. So now the dominant policies globally are free market economics (despite causing the great financial crash and recession of 2008) that measure countries’ development in terms of crude measures of economic growth such as GDP. 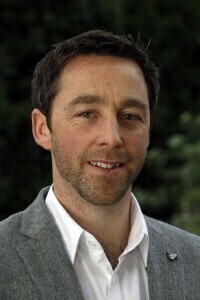 And this means that measures of people’s and society’s well-being – from health to mental health, economic and social inequalities, housing affordability, sense of safety and community, or the support for caring roles for our vulnerable populations and disadvantaged communities – these are all secondary (and even lower in policy and political priority terms) considerations and are not prioritised. At the World Economic Forum (WEF), there will be lots of discussion, sincere frowns and strong words about the state of the world. This year they even have sessions on ‘Society Divided’ and ‘Solving the Economic Generation Gap’. But there will be no acceptance of the role of their policies in bringing us to where we are. Business will continue as usual and governments, corporations and financial investors will meet, ‘network’ and exchange ideas and approaches on new ways of how the private sector can get more government contracts – like Public Private Partnerships – in areas like health care, elderly care, climate resilience, housing and transport – and how taxes on corporations, high earners and the wealthy can be minimised and finance further de-regulated. How the economic globalisation train can be kept on its tracks – shuttling us and the planet towards a global dystopia. Irish Finance Minister Pascal Donohoe (and possibly the Taoiseach) will be there speaking and representing the interests of big Irish businesses and large multinationals based in Ireland. 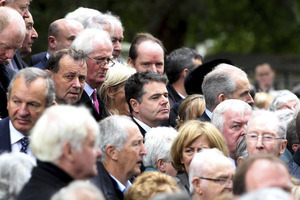 But officially they are there representing you, the Irish public. But don’t worry. They won’t mention any of the ‘downsides’ of the great Irish economic ‘recovery’. Instead they will extoll the speed and extent of the recovery (again using the narrow measurement of GDP growth). 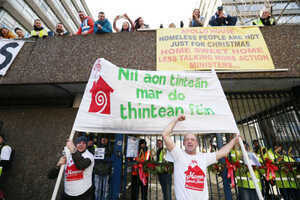 There will be no mention of the socially and economically damaging housing crisis and homelessness (remember Fine Gael is the party whose Minister Damien English scolded us malcontents in the Dail in November last year for ‘talking down our country’ and ‘damaging Ireland’s international reputation’ by having the temerity to suggest that the government’s response to homelessness is ‘dysfunctional’). And don’t worry – our reputation will be kept intact. We will put our best face out for the global elite. There won’t be any mention of the deep inequality in wealth in Ireland. Where the wealthiest top 10% hold over half (53.8%) of all of Ireland’s wealth while the bottom half of the population have just 4.9% of the wealth. Nor will there be mention of the income inequality resulting from the very high rates of low pay in our workforce. 105,000 people who are working are living in poverty – the “working poor”. Nor will there be mention of one of the most social corrosive and damaging issues which is given very little consideration – our high poverty rates – which are still double what they were prior to the crash in 2008. The proportion of our population (8.3%) in consistent poverty is double the 2008 rate. 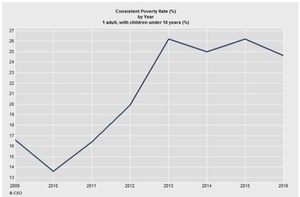 And for our most vulnerable –lone parent families and their children – a quarter (24.6%) of them are in consistent poverty (up from 16.6% in 2009). Don’t worry, neither the Irish Ministers nor the compliant media will embarrass you by mentioning the 790,000 people in Ireland who are living on an annual income below €12,358 (60% of the national median income – who are defined as being ‘at risk of poverty’. Or that a quarter of a million of these are children. Or that a fifth of our population – 1 million people in Ireland – are experiencing deprivation. And a quarter of all children experience deprivation (still much higher than the 15% rate in 2007). Deprivation is defined as households excluded from goods and services considered the norm in society, due to an inability to afford them. Individuals who experience two or more of eleven listed items are experiencing enforced deprivation. Don’t worry this hidden underbelly of a deeply unequal recovery will get little attention. The reality is that Ireland, in contrast to what our Minister for Finance will be saying in Davos, should not be held up as a poster child economy for other nations to follow. We are a tax haven facilitating some of the wealthiest corporations in the world to avoid contributing to society and we bailed out our banks and developers at enormous and devastating costs to society. Both of which have resulted in massive austerity and under investment in public services leaving us with unprecedented housing and health crises that are amongst the worst in the developed world. But if you think about it – Ireland is in fact the real poster child for global capitalism and the global elite in Davos. Here in Ireland we are a model ‘hyper-capitalist’ nation. Corporations pay little tax and make massive profits, workers do not have strong labour protections and collective bargaining –unions are not allowed to represent and organise workers in many private companies. At the height of the crash and recession – the Fianna Fail/Fine Gael/Labour governments encouraged the vulture funds and financial investors to come in and feed off the carcass of an austerity ravaged population. So the wealth of the global and Irish wealthy has grown even further from the exploitation of the population, most significantly the poor and young people paying ever higher housing costs as rents or mortgages. Public investment in public services is one of the lowest in the EU which leaves lots of opportunities for the private sector to provide public services and make a huge profit (we can see this in the growth of private healthcare). There is scant constitutional protection for citizen’s human right to housing or healthcare – but the right to profit and private property is promoted and protected. Indeed, Leo’s Republic of Opportunity is a nice little corporate paradise for the private corporations, financial investors and the wealthy. But Ireland’s reliance on its tax haven status, the financial sector and multinational corporate investment and the low level of public services and indigenous business investment makes Ireland deeply exposed to the future financial and economic crash, as was the case in 2008. This is rarely spoken of. And even more importantly for the global elite – Ireland has played a very important role in the rise of global inequality in the past three decades – our financial tax haven industry based around the IFSC has helped the corporate and financial elite reduce and avoid taxes owed to national governments and thus increased their profits and wealth accumulation. No wonder then the Irish politicians get such a welcome in Davos. But it doesn’t have to be like this. Countries like Sweden and Finland have much more equal societies, better public services, better businesses and more sustainable economies – everyone is better off in more equal countries. And even the global elite at the World Economic Forum know that their global order of hyper -capitalist globalisation they have created is deeply unstable –with another financial crash inevitable, is deeply unequal, and threatens the future of the planet. But they aren’t going to change direction – they have already shown they have no interest in that, and why would they – the elite benefits from the status quo. So, as always, it’s up to ordinary citizens, communities, social movements, trade unions, critical NGOs, progressive politicians, and others, like you, to come together and bring about the change needed towards fairness, social and environmental justice. Posted in Misc and tagged Dr Rory Hearne at 9:31 am on January 22, 2018 by Rory Hearne. Things aren’t wonderful today, and we need to improve. However it is the best time for a human to be alive. 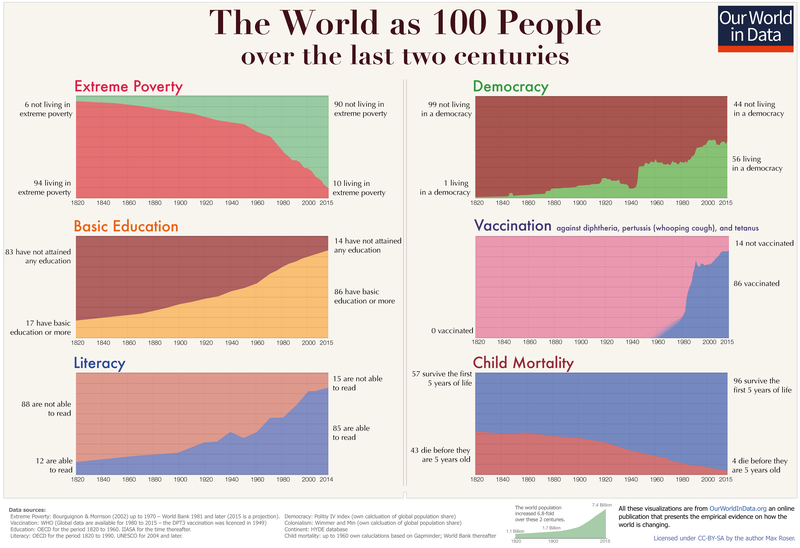 Look at all these charts and see that in the last 200 years: extreme poverty and child mortality are dropping; literacy, basic education, vaccination, and democracy are all rising. Cop on Cian. Next you’ll be reminding people that if they earn more than €30k they are in the top 1% in the world. Someone should point this out to Dr Hearne, and ask him if he intends giving all of his money away. To ‘even it up’, as it were. “They don’t mention…” like you don’t mention that the world population quality of life, is and has been, consistently increasing under capitalism…. for decades. Socialism couldn’t do that. China and India pulled hundreds of millions of people out of poverty through enterprise…. ie, capitalism. The rich are parasites that live off the rest of us. The truly ingenious thing is that they have convinced nearly everyone that the most poor of us are actually the parasites. Similar to the fungus that eats ants from the inside out and compels them to anchor themselves to leaves so the spores can spread. The party that keeps the poor poorer, the rich richer and the middle in a vice. 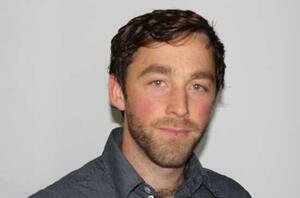 Will there be a toast or a minutes silence for Sutherland? In layman’s terms that’s average income per human in the world adjusted for inflation. It is the most sustained rise in material living standards for humans ever seen, and, ever likely to be ever seen. Rory is foregrounding some VERY SMALL changes in income and wealth inequality while ignoring the VERY LARGE increase in average incomes and wealth. But 2% of the population has over 80% of the wealth. So their incomes skew the average. You we’re around for the 80’s, were you?